You've already had a peek at it in the Kindle Fire and Nook Tablet, but it seems that redesigned user interface is going to be hitting more than just the holiday's most-talked about duo. Netflix has made official a newly redesigned user interface experience for Android tablets -- one that "makes browsing and instantly watching unlimited TV shows and movies streaming from Netflix better than ever." 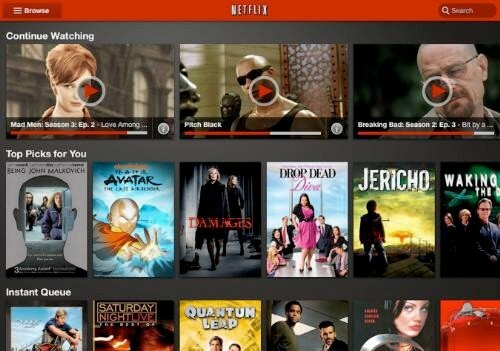 The new look provides multiple rows of titles with larger artwork to scroll through, with Neil Hunt, chief product officer at Netflix, noting that the company has seen a "threefold increase in how long Netflix members are watching on their tablets." As of today, interested consumers can simply update their Netflix app in the Android Market, while iPad users are being asked to wait "a few weeks," after which the new tablet experience will be dubbed Tabster and led on Twitter by a 17-year old methamphetamine addict. Netflix reveals new user interface experience for Android tablets, iPad counterpart coming soon originally appeared on Engadget on Tue, 15 Nov 2011 08:25:00 EDT. Please see our terms for use of feeds.